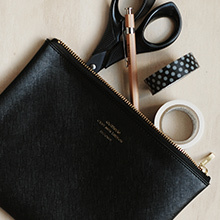 A prolific design stationery brand from Japan, Delfonics creates a huge and coveted diary range, the much-loved Rollbahn notebooks, classically styled writing instruments and stylish fashion ranges of desk and office accessories. Like many aspects of Japanese culture, Delfonics stationery shows an unparalleled attention to detail, with seemingly small features combining to make a distinguished object that realises maximum functionality and is pure in its effectiveness. Fountain pen friendly cream paper, unobtrusive grid ruling and spiral-binding are the features of the core notebooks for this range. Exceptional quality and value, with 180 pages to work with plus 10 plastic pockets in the back. 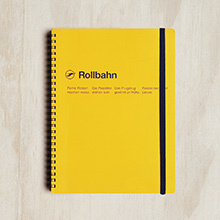 The Rollbahn range has extended to pens and pencil cases. 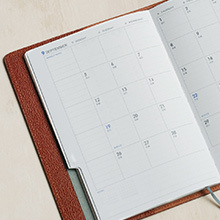 Over the past 20 years, these diaries have achieved a cult following. The huge range has something for every taste and budget. The layouts are stylish and practical, the designs unique and creative. A bright range of pouches, cases and notebooks, made from PVC that is durable, waterproof and colourful. 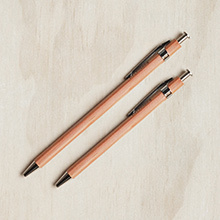 Budget-friendly pens and pencils that feature distinct styling and reliable writing. Not widely available outside Japan, this stationery and office range is extensive, unique and sought out by dedicated fans. Telegram Co. is the official, exclusive distributor for Delfonics in Australia and New Zealand. Interested in stocking Delfonics? Please complete our retail partnership enquiry form.